Eleanor Flood knows she is often disorganized and self-absorbed, so today she is determined to be a better person, to give to the people in her life the attention, gratitude and love that they deserve. But events seem to conspire against her, and despite her best intentions the day spirals out of control faster than you can say "I know... right?" 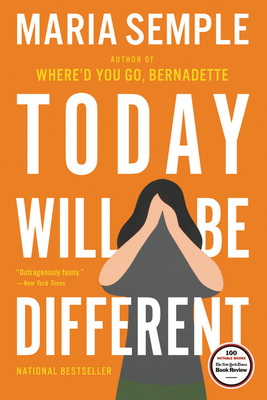 In Today Will Be Different Maria Semple has brought us another imperfect but lovable and zany character that we can't help rooting for as she grapples to accept certain aspects of her life, and she is blindsided by the fact that her husband has taken a one-week "vacation" from work that she knew nothing about. Fans of Where'd You Go, Bernadette will welcome the return of Semple's singular sense of humor and her unique combination of sensitivity and funniness that kept me turning the pages.